Can't work out a song's chords? Let Player have a go. How do you like the sound of a free app that shows you the chords being used as a song plays, making it easier for you to learn it? That's the premise behind Player, a new iOS release that comes billed as 'the musician's music player'. Once you open a song in Player, the app first searches its database for verified chords. If these aren't available, the song is analysed and chords are suggested. The developer claims that chord suggestions are "about 80% to 100% accurate"; if they're wrong, you can change them in an editor. 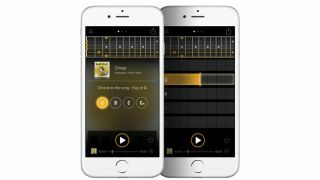 Player also promise to present chord finger positions for guitar, piano and ukulele, and works with any songs that are stored on your iOS device. We're told that support for streaming services such as Spotify is in the works. Other features include the option to slow songs down so that you can master those tricky sections, and the ability to create setlists. Find out more on the MIQ website. Player is available for free from the Apple App Store.